In the first of a new series of posts, Ryan Thompson shares his two-year-old's thoughts on video games. Today, he takes a look at Bit Trip Presents... Runner 2: Future Legend of Rhythm Alien. I occasionally (often) play stretches of video games with my kids around. My daughter’s interests influence what games will be played. She is old enough now to express her interests and opinions in ways that only toddlers can. This series of posts will use her thoughts to summarize our gameplay experiences. First game of the summer is Bit.Trip Presents… Runner2: Future Legend of Rhythm Alien. We played it side by side enough that Daughter will repeat the announcements of the game’s title at random moments throughout the day. Runner2 received plenty of positive praise and mostly favorable reviews, but what did a two year-old think of the colorful, precise and full of character auto-runner? “Bit.Trip Runner runs FAST! JUST LIKE THIS,” Daughter says as she runs up and down the hallway. As the floor buckles from her heavy footfalls, she adds, “Jumps UP and DOWN and ROUND and ROUND!” This is her description of the basic gameplay of Runner2, combined with a phrase from a current favorite book, Pony Brushes His Teeth. There’s a bit more to the game then jumping, but I’m glad Daughter isn’t trying to slide, kick, jump-kick or block pixel projectiles while she zooms up and down the hallway. Daughter’s favorite part of the game is the variety of characters. Kids can be fickle, and every level saw a change in costume or character. Runner2 features 8 characters: male, female and retro versions of the main hero, a pickle, reverse merman, anthropomorphized oil can, an elder of the Video species, and Daughter’s favorite (or least, depending on the minute), a hamburger-headed humanoid. She really liked “Hamburger,” actual name Whetfart Cheeseborger, enough that she requested a hamburger dinner. I happily obliged, and she proceeded to take her mini-burger apart in the way Cheeseborger comes apart after a missed jump or hit obstacle, claiming “it’s just like hamburger girl in Bit Trip Runner!” If only she actually ate her dinner with such enthusiasm. Runner2 was purchased as part of the Humble Nintendo Indie Bundle. This is the first of the games available in the bundle we’ve completed, and it’s also the first game my daughter has requested to play with no encouragement from a parent. Posted on July 17, 2015 by Ryan Thompson and filed under Reviews and tagged kids endless runner bit trip nintendo. Come join me for Extra Life on Saturday! I've been remiss. 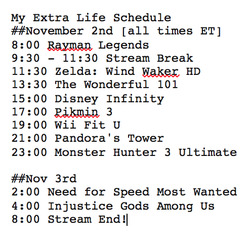 I've forgotten to talk about Extra Life here on the blog until now! Whoops! Well, it's time to fix that. This year will be the first time I'm taking part in Extra Life, a 24 hour game marathon to raise money for Children's Miracle Network Hospitals. I will be raising money for Sick Kids Foundation here in Toronto. It's going to be a little crazy as I get into the wee hours, but hopefully I'll make it for the whole thing. The fun thing about being a Dad is that my kids are now old enough to play with me, and they'll be helping me out through the whole day. They've promised that they'll wake up early on Sunday to relieve me for the last few hours, so that should be interesting! To donate, go to www.extra-life.org/participant/gamerparent and help me reach my goal of $500! Posted on October 31, 2013 by Eugene Huo and filed under gamerparent tv and tagged charity extra life games kids streaming. kotaku says these commercials are awful. I think they're perfectly tuned. What do you think? Listen, I'm all for advertising to core gamers, but I think all the core gamers have already bought their Wii U's. That amounted to what, ~2 million sales? Now Nintendo is going for the rest of their Wii market. You know, the other 90+ miliion people. The parents, the families. The traditional market for Nintendo. These ads are perfect and to the point: games for kids, games for parents, games for kids and parents together, this is why you need to upgrade. I feel like that's a key word right there. Parents don't need to be sold on specs, or features. They need to know that there are games, and that it's an upgrade from the Wii that they probably already have. That's it. Parents know what an upgrade is. It helps fight the "Wii U as a peripheral" misconception. For the target market of these ads, parents, it's perfect. 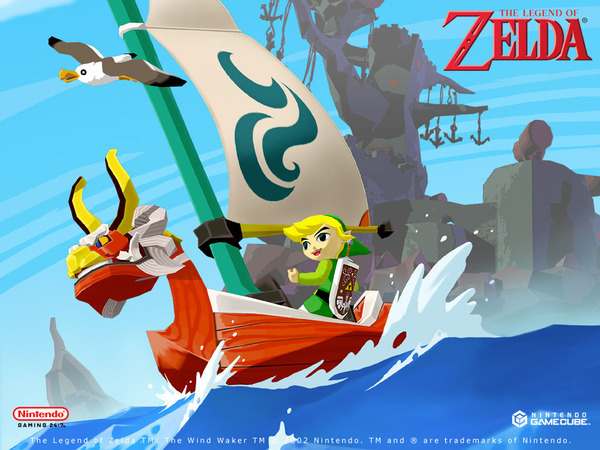 Posted on April 22, 2013 by Eugene Huo and filed under News and tagged WiiU advertising family kids nintendo parents. Nintendo has made clear their policy regarding its younger users and the Miiverse, in a recent update to the Miiverse code of conduct rules: "For the protection of younger users, direct friend requests are not possible in Miiverse for users aged 12 and under. At the same time, younger users can make friends on Wii U outside Miiverse by entering each other's Network IDs in the friend list on the HOME Menu." So it's basically back to the way we used to do it on the Wii, you'll need to both directly add the Nintendo Network ID of the other person you wish to friend into your friends list, rather than making a friend request from Miiverse itself. Nintendo also provided some guidelines for kids to follow when adding friends, recommending that they only add people that they know in real life, like friends from school or the neighbourhood. They also cautioned children not to attempt to share their Nintendo Network ID's over Miiverse. Posted on February 7, 2013 by Eugene Huo and filed under News and tagged children friends kids miiverse nintendo online parents. Notice anything different about these two screenshots? One shows my WaraWara Plaza, and the other shows my daughter's, with Parental Controls Game Rating set to only allow up to T (Teen) rated games. That's right, the games are different. ZombiU, Assassin's Creed III, Call of Duty: Black Ops II, Batman Arkham City, which all have been fixtures on my WaraWara Plaza since day one, are gone. Instead we have Trine 2, Nano Assault Neo, Madden 13, and Disney Epic Mickey 2. For each user account on the Wii U, Nintendo gives you the ability to manage Parental Controls, limiting the ESRB rating of games they can play, access to the browser, Friend List, Online Play, Miiverse, eShop, and so on. It also gives parents the ability to lock out Data Management and changes to Internet Settings. Parental Controls stop short of providing a daily time limit or blackout periods for gaming, but it's a pretty comprehensive system, and kudos to Nintendo for thinking this out clearly. It's nice to see that the ESRB rating limits automatically extend to the WaraWara Plaza as well. * Some of those Miiverse drawings that people draw can be pretty scary. Right? I mean, not to me. But if I was 7 years old, maybe. Except for Bowser. He's ok.
Nintendo helping parents do a good job of giving little ones a safe environment, away from Zombies and other scary things that keep them up at night. Because honestly, if the kids are staying up, that means less gaming time for us parents. *You can change which games show up on your own WaraWara Plaza by going into the Miiverse User Menu Settings and changing the "What kind of games do you want to see on WaraWara Plaza" setting. Posted on November 24, 2012 by Eugene Huo and filed under News and tagged ESRB kids mature parental control parents rating settings teen. According to gamespot, parents setting up a Nintendo Network account for your children under the age of 13 will need to pay a one time fee of $0.50. This acts as proof of consent to create a Nintendo Network account, and is in accordance with the Children's Online Privacy Protection Act (COPPA). 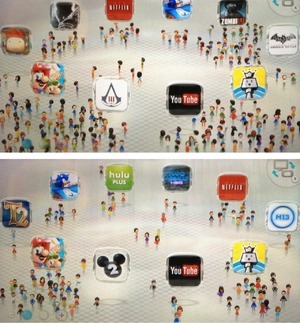 It's a minor annoyance, to be sure, but I think it helps highlight the difference between Nintendo and other platforms. Nintendo actively assumes that there may be kids playing on their system, and thus is proactively compliant with child safety standards. It is surprising because I hadn't heard of anything like this before. I knew that there was a facebook age limit of 13, perhaps this is the same COPPA regulation at work? Note that this applies to an online Nintendo Network account. It doesn't apply to user accounts on the system, or Mii's, or anything that is just local. Posted on November 18, 2012 by Eugene Huo and filed under News and tagged account kids nintendo ID online parenting parents. Posted on November 13, 2012 by Eugene Huo and filed under Countdown and tagged WiiU friends kids online parenting rules. Kotaku headline reads: "Mother Grinds Through Online Game So Her Daughter Doesn’t Have To". This happened in China, where a daughter's restricted screen time lead to many tantrums. And so, like any loving parent would do, her mother did the only thing she could. She plays the game, Mole Manor, and grinds through to level up her daughter's character. The headline should read, "Mother secretly loves Mole Manor and purposely restricted her daughter's screen time so she could play"
Have you ever played your kids games for them? I have. Mostly when the game is on my iPhone, which the kids don't always have access to, I am 'requested' to check Snoopy Fair or Pocket Frogs during the day. At least we're not doing their homework for them, right? Posted on November 8, 2012 by Eugene Huo and filed under News and tagged Asia MMO gamine kids online parenting screen time. So recently I made the mistake of watching the October Apple event at the dinner table. After the iPad mini was shown off my 9 year old turns to me and says: "I want one, can I have one for Christmas?" Oh boy... what have I done? I ended up putting it on our awards for good behaviour and chores, using our star system that I keep track of using Awards. Posted on October 29, 2012 by Eugene Huo and filed under Article and tagged Christmas apple gift iPad mini kids parent reward. 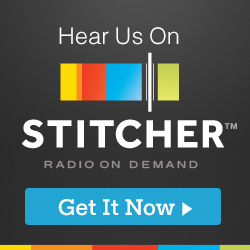 A few months back I was listening to the Gamers with Jobs podcast and the episode was from the PAX East panel. After the main panel discussion concluded there was a period for audience questions, and one gentleman came up to the mic and asked about whether we as parents should 'throw' games for our kids, ie. let them win. He has a six year old son, who is very competitive, and speaking about fighting games specifically (Marvel vs. Capcom), he said that sometimes his son gets things right, and he can win, but most of the time his son loses to him. His son cries when he loses, and the dad was wondering if it was ok to take it easy on our kids or not? From his own experience he recalled his days in the arcade, getting beaten in Mortal Kombat and walking away thinking "that sucked". He wanted his son to recognize that sometimes you're going to lose, but on the other hand he wants his son to still have fun. "I feel like I'm cheating him if I let him win all the time," he concluded. I don't know why this question still resonates with me the way it does, but I wanted to put some thoughts down about it. If you listen to the podcast, Julian Murdoch answers the question in the affirmative: "I just give my kids a good game. I don't destroy them just because I can. The real question is, do I throw games for your kids? The answer is, f*ck yeah, of course I throw games for my kids." There are two quotes which came to my mind, the first is from "Daughters" by John Mayer. "Boys you can break / you'll find out how much they can take / Boys will be strong / and boys soldier on..." The second is from Ephesians 6:4 in the Bible: "Fathers, do not exasperate your children; instead, bring them up in the training and instruction of the Lord." Now how does this apply to video games? From my experience, I don't have boys. I have two daughters, and what I feel about them is perhaps different from parents with boys. Maybe boys are tougher, maybe they can handle more. But I've experienced my share of my kid bursting into tears because they didn't win against me in some Mario Party minigame, and conversely, having a child also say, "don't take it easy on me this time, ok daddy?" If you're so competitive that you simply beat your kids at games all the time, then of course your kids are going to be frustrated. It's no fun to lose all the time and never win. But on the flip side, both losing and winning are part of playing the game, and as kids grow up, as parents we do have to help them learn how to handle losing, as well as handle winning, I think. Posted on September 3, 2012 by Eugene Huo and filed under Article and tagged compete fair kids. In a new article on Disability Scoop, a study claims that "Video Games may Benefit Kids with Cerebral Palsy". To be clear, the study tested with four specific games, Wii Sports Bowling, Tennis and Boxing, and Dance Dance Revolution. They found that the games encouraged repetitive movements, while providing positive feedback in a fun environment, according to the study published online this week in the Archives of Physical Medicine and Rehabilitation. Significantly, the researchers said children with cerebral palsy who typically utilized one, dominant side of their body were engaging their full body when playing the games, suggesting that the activity could be a low-impact way of achieving therapeutic goals. “While our results did not show that (active video) game play can be regarded as a replacement for more vigorous physical activity or muscle strengthening, we found that some games may provide targeted therapy focused on specific joints or movements,” said Elaine Biddiss of the University of Toronto who led the study. It's interesting that while the headline says "Video Games" the actual games in question are uniquely active games that exist within a very narrow category of video games, and aren't your traditional PC or console games. Posted on May 8, 2012 by Eugene Huo and tagged active cerebral palsy kids research study.